The Devils were not done being buyers at the trade deadline before its end at 3 PM today. 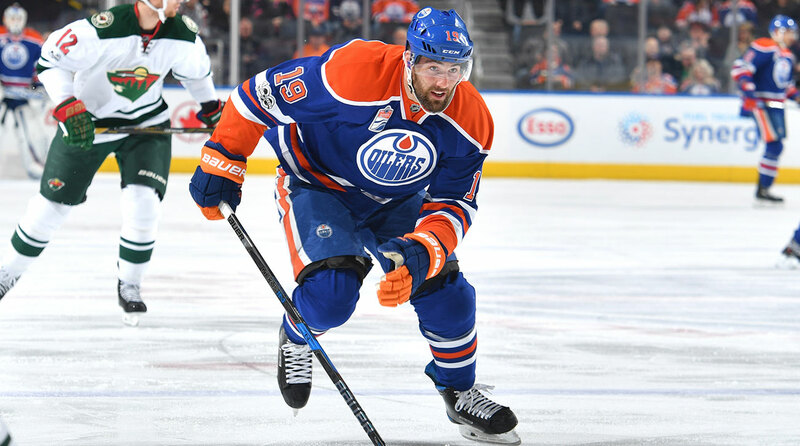 They sent a third round pick in the 2019 NHL Draft and the rights to JD Dudek, who is currently at Boston College (the Devils’ fifth pick, 152nd overall in 2014) to the Edmonton Oilers for Patrick Maroon. Maroon, a left winger, has 14 goals and 30 points in a total of 57 games this year. Now, the main issue is that the Devils have a glut of left wings in their lineup. But, as many have pointed out, newly-acquired Michael Grabner can also play right wing, which would give the team some depth there and get some of the guys like Jimmy Hayes or Drew Stafford, who have not had as good production this year as the team would like, out of the lineup. Maroon, a 6-foot, 3-inch, 225-pound St. Louis native does have a fair amount of playoff experience despite being in just his sixth NHL season. The 29-year-old, in his time with the Anaheim Ducks and the Oilers, has 12 goals and 26 points in 42 Stanley Cup playoff games. His playoff history includes going to the second round with Anaheim in 2014, the Western Conference Finals with the Ducks in 2015 and the second round last year with the Oilers. He did play with Taylor Hall in Edmonton for a few months, having been traded there on February 29, 2016 from Anaheim for Martin Gernat and a fourth round pick 2016 Draft that became Jack Kopacka. Maroon played one year with the London Knights of the Ontario Hockey League – in which he notched 90 points (35 goals and 55 assists according to the Devils’ press release). Maroon was then taken by the Flyers in the sixth round of the 2007 NHL Draft, 161st overall. This is a move to give the Devils some playoff fortitude. Maroon has had some success in the playoffs and the Devils are showing that they are going for broke by giving up some assets to get pieces for the playoffs. They want to make the playoffs and, hopefully go far – although I am sure management is realistic about the team’s chances to the win a Stanley Cup. Factor in that they only gave up essentially a second rounder, a third rounder, Yegor Rykov and JD Dudek for Michael Grabner and Patrick Maroon. That is getting things ready for a playoff run in the now and it is good to see the Devils strike when they are hot. The Devils are now all in about making a run at the postseason. This move only makes them stronger. Note: photo at the top of this post is via SI.com. The Devils have acquired some help on the blue line in the form of Sami Vatanen from the Anaheim Ducks. They today announced that they have sent Adam Henrique, Joseph Blandisi and their 2018 third round pick west to the Ducks in exchange for the defenseman and a conditional third round pick. The Devils needed help on the back end and Ray Shero had this to say about the deal: “In acquiring Sami, we bring on a right shot, top-four defenseman who can play in all situations. This move also gives us contract certainty on the back end for the next two-plus years.” Vatanen is “in the second year of a four year, $19.5 million dollar contract ($4,875,000 AAV)” according to the press release. Shero also added: “When acquiring a defenseman like Vatanen, you have to give back quality assets or players in return. That is the case in this situation with Adam and Joe. Adam has been a key member of our organization for nearly ten years since he was drafted. His contributions both on and off the ice will always be appreciated by our organization and fans. For Joe, this is a great opportunity with a quality organization like Anaheim and I am happy for him.” Shero was, of course referring primarily to Henrique’s overtime goal in game six against the Rangers in the 2012 Eastern Conference Final when he mentioned “on ice contributions.” That one goal will cement ‘Rico’s’ legacy in Devils lore forever. So what are the Devils getting in return? Vatanen is 26 years-old and a native of Jyvaskyla, Finland. He was the Ducks’ fifth selection (taken in the fourth round) pick in the 2009 Draft – taken 106th overall. The press release notes that he was taken by Anaheim in the same draft class that they took current-Devil Kyle Palmieri. He has represented Finland in the 2016 World Cup of Hockey, 2014 Winter Olympics, 2010 and 2011 World Junior Championship and 2010 World Championship. He currently has one goal and three assists in 15 games (missing the first nine games of the 2017-18 season recovering from shoulder surgery he had in the off season). He “finished second in scoring among Ducks defensemen last season, and led all Ducks defensemen the two years prior to that.” The press release also says that he “finished third on the Ducks in time-on-ice each of the past four seasons.” In four-plus seasons with the Ducks, he has played in 280 NHL regular season games. In that time, heas has 33 goals and 93 assists (126 points), 116 penalty minutes and a plus-22 rating. He has also played in 40 playoff games with five goals and 17 assists (22 points) and 18 penalty minutes. He is a smaller d-man at 5-feet, 10-inches tall and 126-pounds. All of the above information comes from the press release. The defenseman, who played his pre-North American career with JyP Jyvaskyla of the Finnish league, will report to the Devils in Colorado as they get set to take on the Avalanche in Denver tomorrow. He will wear number 45. While it is always sad to see someone like Henrique, who had become such an entrenched part of the Devils and Blandisi, who seems to have such a great upside, go, the Devils needed to do what they could to get some help on the back end. With Mirco Mueller going down with injury, an already weak spot for New Jersey was made even weaker. Vatanen will fill gaps as, it was noted by Shero, he can play in any situation, something the Devils were kind of limited with the current defense corps as they stood. Good luck to Adam Henrique and Joseph Blandisi in Anaheim and welcome to New Jersey Sami Vatanen. So, yesterday there was a segment of the fanbase who was a little bit upset about the Devils not improving enough on the opening of free agency. Today, Ray Shero reminded fans why he is considered one of the smartest men in hockey. The Devils acquired former Washington Capital forward Marcus Johansson for two 2018 draft picks – the Florida Panthers’ second round pick (which the Devils acquired for Marc Savard, an all but retired-from-concussions-player whose contract was only taken on to reach the cap floor) and the Toronto Maple Leafs’ third round pick (which New Jersey got as compensation for the Leafs hiring of Lou Lamoriello). Johansson is 26 years old, a seven year pro and a native of Landskrona, Sweden. Last year he had a career high in points with 58 (coming off of 24 goals and 34 assists) according to the Devils’ press release. The press release notes that five of those goals were game winners and two were overtime goals. He played in all 82 games last season. Those 58 points put him fourth on a stacked Washington team in scoring (behind only Nicklas Backstrom, Alex Ovechkin and Evgeny Kuznetsov – not a bad lineup there – he finished only one point behind Kuznetsov to boot). The left-shooting winger gives the Devils some pop in the offensive category, somewhere the team has been lacking in for a long time. He had just signed a three-year, $13.75 million contract with the Caps last year. The contract has an average annual value of $4.58 million. Although the team still has some holes in varying places, this helps them along very nicely. They certainly benefitted from the Capitals early exit in this year’s Stanley Cup playoffs, as Washington has been retooling and did not see Johansson as part of their future plans. Speaking of the playoffs, he has obviously played a lot of playoff games for the Caps in recent years and since 2011, he has nine goals and 21 assists for 30 points in 69 games along with six penalty minutes. Two of those goals came on the power play. One of the main reasons that the team went after Johansson was his possession stats. If you are familiar with Corsi, he has a 49.7 Corsi for percentage at even strength throughout his career according to Hockey-Reference.com. Similarly he has a 49.4 Fenwick for percentage at even strength. These stats basically measure how much his team controls the puck when this player is on the ice. This plays into John Hynes’ wish for the team to be a strong puck possession squad. But no matter if you are into analytics or the eye test, there is no denying that Marcus Johansson is a good player. He will make the Devils’ offense, which has struggled to say the least (they finished third from the bottom in goals for – behind only the Avalanche, who were historically bad last year, and the Canucks – with only 183), that much better. And all this for only two acquired picks.